It is important to do your homework when shopping for your next car. Many if not most of the reviews you’ll read pertaining to our line of sport and luxury cars will, at one point or another, make a reference to a cat. While the link with our storied brand’s name is obvious, there’s another reason for it: the way our cars drive. Agile and dynamic both serve as adjectives to describe the driving experience in all our cars and that includes our superb, award-wining XE compact luxury sedan. We designed and engineered this car to redefine what such a car is and can be all the while maintaining unmistakable Jaguar styling and performance. From the onset, our XE Premium meets all expectations. All-Wheel-Drive (AWD) and Intelligent Driveline Dynamics with torque vectoring are all standard and provide surefooted driving characteristics. As the driver, you can select the drive mode which best suites your mood through the JaguarDrive control button. Power-wise, all XE cars, save for the S, offer a choice of three engines from our Ingenium range. There are two petrol options (247 and 296 horsepower) and one 180-horsepower diesel. All are untra-efficient turbocharged 2.0-litre 4-cylinder mills. The Prestige builds on the Premium and adds exquisite interior materials and desirable technological features such as Jaguar InControl Touch and its advanced tablet-style touchscreen and keyless entry and start. The R-Sport turns up the heat and stirs emotions with a bespoke body-kit, alloy wheels and an upgraded interior with sport seats. Things get serious when the S is selected. Not only are you privy to all the desired luxury and customizable touches but performance is dialed to the maximum with the addition of our supercharged 3.0-litre V6 which produces an impressive 380-horsepower. 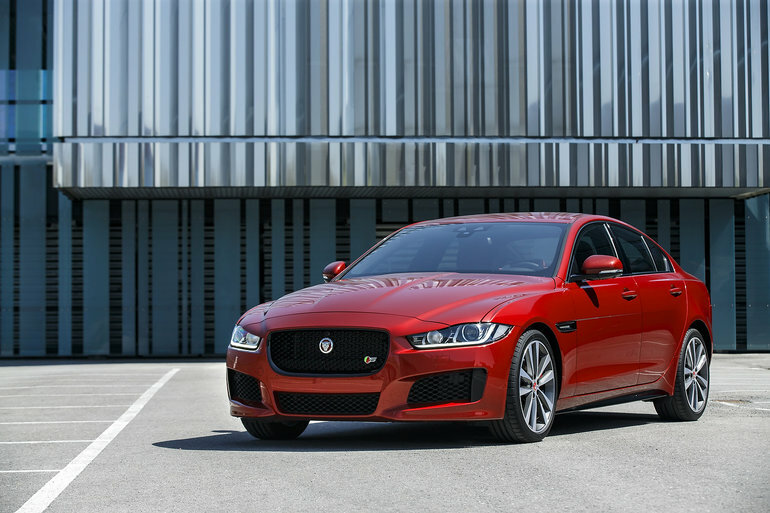 The last, and certainly not least, iteration of our 2019 Jaguar XE is the Portfolio. It is designed for the most discerning customer that desires the finest that we have to offer without opting for a larger car. Included features are 18-way perforated Windsor Leather seats, a 12.3-inch full digital instrument panel and 10.2-inch multi-touch display and Meridian Digital surround sound system. Driving the 2019 Jaguar XE is to reconnect with the road and appreciating your surroundings. Come and discover for yourself why everyone’s raving about the 2019 Jaguar XE.